Directions: For a larger view of any image, click on the small image. To return, click your browser's back button. 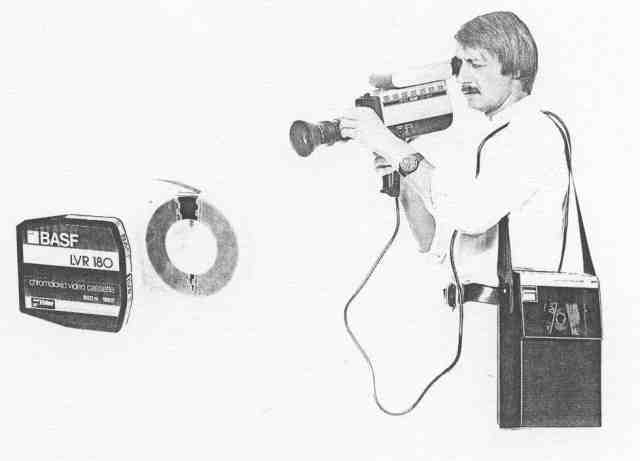 Prototype Longitudinal VTR: 1979 Eumig starts with the development of a portable Videorecorder based on the by BASF developed LVR-Video-System (“Longitudional Video Recording”, recording by means of 48 parallel videotracks). At the end of 1979 the further development of the LVR-System was cancelled, because the chances of succeeding for this system in the market were rated as too low. The LVR-System (Longitudional Video Recording) distinguishes itself by the very small, mechanical simple and because of that cheap videocassettes. Besides that, in comparison with the present day systems, it offers real value for money recording- and playback machines with a compact size and low weight. Because of that this system can be used as a home recording system for tv-broadcasts as well as – in combination with a camera – a recording device for outside use. The recording works by means of 48 parallel videotracks and 2 audiotracks. After about 2,5 minutes playing there’s an automatic switch to the next track. It takes about 0,1 second to switch tracks and to overcome interruption during that switch information is stored in a memory. Total playing with a standard cassette is at the moment 2 hours, but there are plans to double the tracks (and playing time to 4 hours). Photo and Info" Marcel Snijders.